Tag Archive | "national weather service"
Suspected tornadoes masked by heavy thunderstorms and rain swept through central Florida on Thursday. The dangerous tornadoes flipped cars, damaged buildings and houses, and caused temporary loss of power in some parts of the region, officials said. Most people affected only suffered minor injuries such as bruises and bumps. Seventy people, who had gathered for the Sun ‘n’ Fun Aviation Fair, were temporarily trapped inside a tent at the Lakeland Linder Regional Airport. The tent collapsed as strong winds and heavy rains made its way through the exhibit. The storm damaged several aircraft, which included vintage biplanes and some larger planes. The winds were reportedly rushing at 90 miles per hour in Tampa. Emergency crews from Polk County rapidly responded to the incident and freed the people who were trapped, officials said. Injured people were brought to and treated at the Lakeland Hospital, director of Polk County emergency management Pete McNally said. Severe storms hit the country since Wednesday. Meteorologists from National Weather Service said a tornado swept north of Tampa and a larger one came from the Gulf of Mexico and raked across Florida Peninsula. Strong winds damaged 60,000 to 80,000 homes and buildings. On Wednesday, winds reportedly blew a cruise ship from its dock and flipped a tractor trailer in separate parts of the country. According to the National Climatic Data Center, Florida encounters the third most tornadoes in the United States per year. 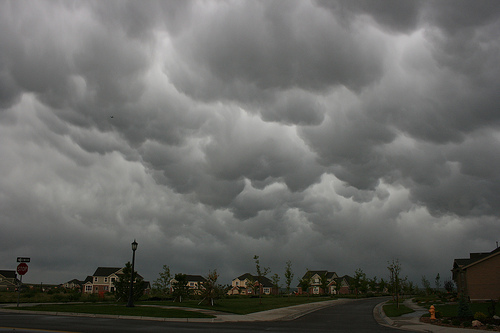 Annually, it experiences about 55 tornadoes. The most fatal tornado occurred in Florida in 2008. Rising rivers caused by several days of continued rain forced hundreds of families out of their homes in Maine and Maryland on Friday. However, flooding across the East is still far from a widespread catastrophe. Currently waning out from the snowy winter season, areas outside of the city of New York were the most affected. Also, northern New Jersey, which is a notable flood-prone area, are still in water. The flood waters are not likely to dry for a couple of days. State police reported that 1,300 homes had to be evacuated by midmorning Friday since they are situated in Pequannock close to the Pompton River. The same happened with 100 homes in Fairfield. By midday, several shelter homes opened as American Red Cross prepared for more. Widespread flooding is likely to occur along Pequannock, Pompton and Ramapo rivers in North Jersey. The rivers are still not likely to reach their peak until Saturday. However, Gov. Chris Christie said worst could happen. Christie was condemned during a blizzard in late December when he was not in the state when it occurred. But now, he has announced a state of emergency even though the rain has not yet started. According to weather agency National Weather Service, there will be no expected major rain for the next few days, which might give a chance for the area to get dry. The department also expected the Susquehanna River located northeast of Pennsylvania to rise as high as 8 feet near Wikes-Barre by Saturday. Moderate flooding occurred in western Maryland while both Monocacy River near Frederick and Conococheague Creek in Fairview were already over their banks. Minor flooding continued along the Ohio River and flood waters in Cincinnati were already 3 feet above the official flood level and still rising. Streams and rivers are overflowing because of melting snow. Additional rainfall on top of that poured some flood waters into communities along Ohio, Indiana and Illinois on Tuesday. The flood killed one woman as her vehicle was brushed into a river. There were four deaths when a storm struck Tennessee. Authorities said flash floods also hit the eastern mountainous part of the state. The region was lashed with high winds and a five-inch rainfall brought about by the strong storms since Sunday. 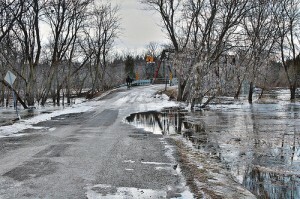 It added to the run-off from the melting ice and snow, which pushed the rivers off their banks. In Ohio, several people had to be rescued on Friday as flood waters from the overflowing Blanchard River submerged residential neighborhoods, as well as part of the downtown area. 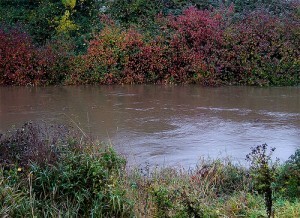 The river crested in the early hours of Tuesday. It was progressively receding while the city was out of danger as opposed to the worst floods experienced in 2007 and 2008, said Mayor Pete Sehnert via telephone. Electricity and water services were available in Findlay. Yet, several businesses and schools were closed, according to Sehnert. The city separated its fire and police personnel on both sides of the river in preparation for the bridges to shut down. The National Weather Service reported that overflowing creeks and rivers in Ohio, Illinois and Indiana flooded some homes, farmland, golf courses and roads. The weather agency gave several flood warnings, taking note of some rivers that had yet to crest. Tamara McBride, from Ohio Emergency Management Agency, said 700 people were evacuated from their homes across northern Ohio. Wind-whipped wildfires ruined almost 70 homes and burned up more than 110, acres of land in West Texas. Windy conditions threatened to cause further disaster, authorities said on Monday. 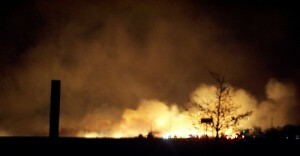 The fires moved rapidly from the strip of land in Texas to the southern plains. It emitted smoke that covered the Interstate 20, which caused a traffic accident close to Midland, killing a 5-year-old girl. This impelled the brief closure of the highway on Sunday. Firefighters struggled to put out the fire until Monday. Mark Stanford from the Texas Forest Service said that downed lines of electricity could have brought many of the blazes in the Panhandle. Also, a welder ignited another fire. A flicker from a car’s tire rim began a fire when a tire burst in the Midland area, Stanford Said. Wind of nearly 70 miles per hour was recorded by the National Weather Service. It helped spread the fire in the Amarillo area on Sunday afternoon. The fire destroyed as much as 68 homes since it started Sunday afternoon. Ten homes were affected in Colorado City and others were in Amarillo area, Kearney said. Abilene, Lubbock, Midland and Panhandle remained at high as a result of the strong winds. However, aircrafts were expected to help by Monday. The wildfires claimed the life of a 5-year-old child, Cameron Dominguez. She died when their pickup truck was caught up in a traffic accident. The Department of Public Security said it involved eight vehicles and two other passengers were injured. A firefighter lived through second-degree burns in a fire in close proximity to Colorado City, which is nearly 250 miles west of Dallas. 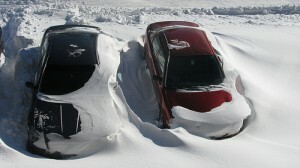 A relentless winter storm was hammering across the upper Midwest, leaving up to 15 inches of snow on Sunday. Areas from Dakotas all the way to Minnesota, including Wisconsin were declared white-out conditions. State officials advised not to travel in South Dakota where most roads were not yet closed. The majority of roads in southern Minnesota were already covered in snow. Drivers have limited visibility and airlines canceled many flights. Travel will be difficult because of the snow and ice in southern Wisconsin, the National Weather Service said. Forecasters even anticipated several inches of snow to cover southern Wisconsin along with some chilly rain that could accumulate ice in some places. The Weather Bureau expected the storm to leave up to 15 inches of snow from Sunday to midway Monday in Minnesota. Previous weather forecasts even expected the snow to accumulate up to 18 inches in some areas of Minnesota. The National Weather Service said blizzard conditions were already developing in south and west of Minneapolis. New Ulm and Lester Prairie were having nearly 8 inches of snow. Meteorologist Tony Zaleski said the snow is blowing around 20 to 30 miles per hour. Airline operations were reduced because of the high winds brought by the storm. The majority of the flights were canceled at St. Paul International Airport in Minneapolis. Delta Air Lines also canceled hundreds of its flights on Sunday. From December until the most recent storm, the total snowfall in the Twin Cities had already reached more than 61 inches. In fact, it is the fifth snowiest season on the record based on the statistics of National Weather Service. Additional 10 inches of snow would bring it to the second snowiest winter on record following the 76.9 inches of snow in 1981-82.